Keeper of the first of the Seven Rings; Dwarf-lord named after Durin I. Durin III was born in Khazad-dum in circa 1600 of the Second Age. He became King sometime during that era. Durin III's region consisted of a large mine in Khazad-dum in the Misty Mountains. Durin's Folk had ties with both men and Elves, and their relations included an alliance with the men of the Vales of the Anduin that lasted until the reign of Durin IV. Durin III was allied with the Elves of Eregion. Sauron had used a faked identity to trick the Elven-smiths there into forging the Three Rings, the Seven Rings, and the Nine Rings in circa the 1500s of the Second Age. The first of the Seven Rings was given to Durin III. In 1697, Sauron attacked Eregion and sought the Rings of Power. He took six of the Seven Rings and was able to find all of the Nine Rings. However, the Elves kept their Three Rings well hidden, and Durin III could not be captured by Sauron. During the invasion, Durin III sent out his armies to Eregion, giving Elrond and other survivors from Eregion time to escape. Sauron tried to pursue the Dwarves but Durin III shut the Doors of Durin, which were not able to be broken down. Sauron distributed the other Dwarven Rings to other Dwarf-Lords. Though Dwarf-Lords were able to resist the dominion of Sauron, many of them became greedy because of the Rings. Durin III passed down his Ring to his descendants, and it survived until Thrain II was captured by Sauron and it was then that the last Dwarf-Ring was destroyed. Durin was the name of a Dwarf in the Old Norse poem Volsupa, and his name translates as "sleepy." Durin III was named after Durin I, and it was believed amongst the Dwarves that any Dwarf-king named Durin had the spirit of Durin I inside of him. They believed that in part, Durin III was a reincarnation of Durin I, though it remains unclear if this is actually possible. 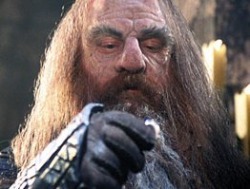 Notice: Seldom did Dwarves reveal their true names to outsiders. It is believed that Durin may have been a name given to the first Dwarf by men of the North, and his true name may be unknown or forgotten. It may be that Durin III had a completely different name than Durin I and Durin II, but he was recorded by men as "Durin III" because of his physical features or his greatness as a ruler. This is only a theory and is not proven or supported by facts, so it cannot be concluded but it may be speculated.